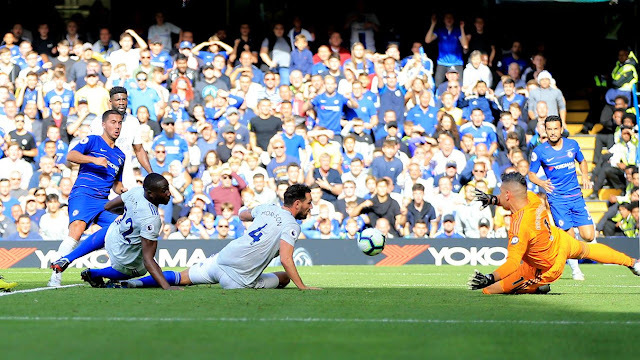 MANILA--Chelsea have zoomed to the top of the Premier League pile after thumping Neil Etheridge and Cardiff City with a 4-1 rout at the Stamford Bridge, Saturday afternoon in London (evening Manila time). In a battle of the blues, Maurizio Sarri got the better of Neil Warnock to maintain his perfect start in the English top flight as the Italian gaffer matched Jurgen Klopp's perfect record this season after winning his fifth match in a row. Moreover, the home side have overtaken Liverpool on top of the table on goal difference, with Sarri getting the honor of winning his first five league matches in charge of a Premier League side thanks to a hat-trick by Eden Hazard and a curling effort by substitute Willian. But it was not the best of starts to the match just 16 minutes in, when Chelsea fell behind early after Ivorian centre-half Sol Bamba poked the ball from close range past Kepa. However, the Belgian went to work with Olivier Giroud and was rewarded with a 37th-minute equalizer that was a product of their 1-2 play with the former getting his right-footed effort well into the bottom left corner. Seven minutes later, Hazard gave Chelsea the lead for good after a repeat action from their first goal, but this time, leaving Bamba and Sean Morrison on all fours to make it 2-1 into the break. The mercurial number 10 completed his hat-trick with 10 minutes to go from the spot, sending the Azkals number one to the other side of the post after the Brazilian was taken down by Bamba in the box. Three minutes later, Willian launched a right-footed curler from outside the box and guides it into to the top corner for the final count. Cardiff remained just two spots above the relegation places over Huddersfield on goal difference as the Terriers were beaten at their own turf by Crystal Palace.